^ L_3137. 今年影响和登陆海口台风个数偏少 强度偏强--人民网海南视窗--人民网. people.com.cn. ^ Headlines - Philstar Mobile. philstar.com. ^ Frances Mangosing. El Niño expected to reach peak in August–Pagasa. inquirer.net. ^ Marine Weather Warning for GMDSS Metarea XI 2015-01-02T06:00:00Z. WIS Portal – GISC Tokyo. Japan Meteorological Agency. [January 2, 2015]. （原始内容存档于2015-01-02）. 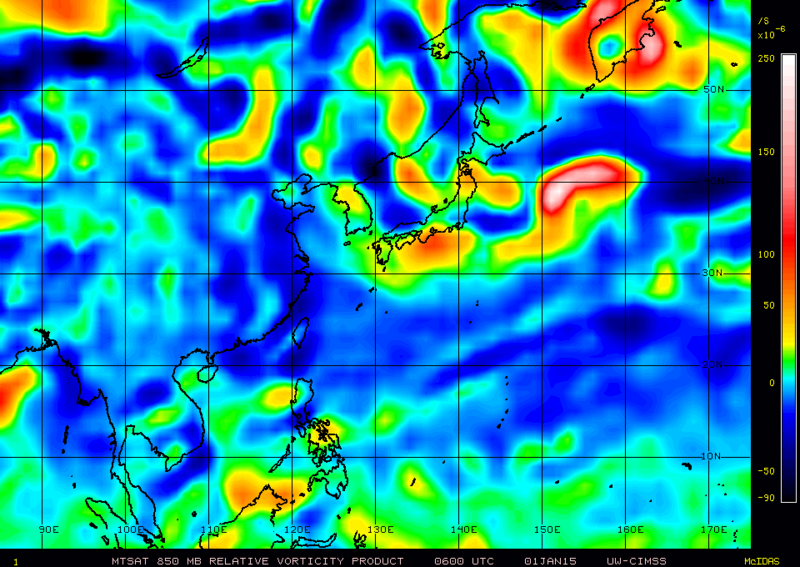 ^ Northwest Pacific Relative Vorticity - Large Scale (850mb) at 06:00 UTC on January 1, 2015 (PNG). CIMSS. [January 2, 2015]. ^ Tropical Cyclone Formation Alert. Joint Typhoon Warning Center. [January 2, 2015]. （原始内容存档于2015年1月2日）. ^ RSMC Tropical Cyclone Advisory 071800Z. Japan Meteorological Agency. [February 7, 2015]. （原始内容存档于2015-02-08）. ^ RSMC Tropical Cyclone Advisory 081800Z. Japan Meteorological Agency. [February 8, 2015]. （原始内容存档于2015-02-10）. ^ RSMC Tropical Cyclone Advisory 091200Z. Japan Meteorological Agency. [February 9, 2015]. （原始内容存档于2015-02-10）. ^ RSMC Tropical Cyclone Advisory 102100Z. Japan Meteorological Agency. [February 11, 2015]. （原始内容存档于2015-02-13）. ^ RSMC Tropical Cyclone Advisory 110600Z. Japan Meteorological Agency. [February 11, 2015]. （原始内容存档于2015-02-13）. ^ RSMC Tropical Cyclone Advisory 111800Z. Japan Meteorological Agency. [February 12, 2015]. （原始内容存档于2015-02-13）. ^ RSMC Tropical Cyclone Advisory 111800Z. 日本氣象廳. [March 12, 2015]. （原始内容存档于2015-04-02）. ^ TROPICAL CYCLONE FORMATION ALERT. CPHC. Central Pacific Hurricane Center. [13 July 2015]. ^ TROPICAL CYCLONE FORMATION ALERT. CPHC. Central Pacific Hurricane Center. [31 August 2015].